I’m kicking off April with Monstress Vol 2: The Blood and Monstress Vol. 3: Haven, a graphic novel dark fantasy penned by Marjorie Liu and illustrated gorgeously by Sana Takeda. Okay, so I cheated a bit in that these are technically two books by an author-artist combo I know, but they are part of one continuous story, so I’m counting them as one. I’d be tempted to binge the series if Volume 3 weren’t the last trade paperback currently available. 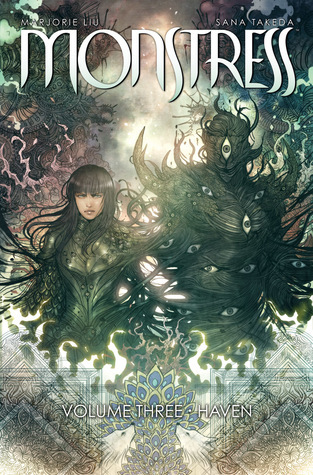 Set in a sprawling world filled with fantastical technology and nonhuman beings, the Monstress series tells the story of Maika Halfwolf, a young arcanic woman whose body is being slowly taken over by Zinn, a many eyed, many tentacled monster with the powers of one of the old gods. 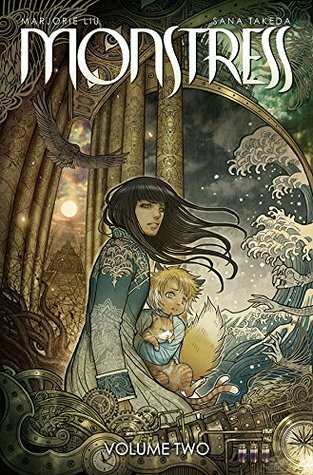 If that paragraph was a lot to absorb, you’re not alone — while I enjoyed the first volume of Monstress, I often found myself grappling with a bevy of unfamiliar terminology around the peoples and history of this world. At first, the story has a serious case of fantasy name terminology that made it hard to grasp what was going on at times. –Ancients are a race of animal people that existed in the world before humans and were once worshiped by them. –Arcanics (like Maika) are the hybrid descendants of Ancients and humans. – The old gods are a race of giant beings that came to this world from Somewhere Else. Long thought to have gone extinct, leaving only their ghosts floating in the sky, there are hints the old gods are merely imprisoned and waiting for a chance to break free. -There are also talking cats (hm, I’m sensing a theme!) who are considered the children of the goddess Ubasti. Got all that? Great, on to the story! In Volume Two: The Blood, Maika and her companions Ren the cat and the arcanic fox girl Kippa take passage on a pirate ship to the mysterious Isle of Bones, in search of answers to Maika’s past. In the process, they learn more about the archaeological research her mother was doing into the Shaman Empress, a legendary magician and inventor from ancient times. While Moriko Halfwolf, Maika’s mother, was a bit of a mysterious figure in Volume One, we learn more about Maika’s relationship with her here: Moriko is portrayed as a driven, abusive parent whose relationship with Maika was based more on shaping her daughter into a weapon than loving her as a person. It’s heartbreaking and realistic despite the fantasy setting, even more so because Liu makes sure to show how the attitudes Maika absorbed color her relationship with Kippa. She’s hard on Kippa when she doesn’t need to be, and doesn’t seem to see that the harsh life lessons she imparts to Kippa were handed down by her mother earlier in the same cycle of abuse. It’s character notes like these that really made me bond with the characters in this volume compared to the first. Monstress: Volume One confirmed Maika as a badass, but in Volume Two we see her be vulnerable, and I love that. Volume Three: Haven kicks the action up a notch: Maika and her companions take refuge in the neutral city of Pontus from the war brewing between the human Federation and the arcanics. The Pontians’ price for letting them stay is that Maika repair their shield, an ancient piece of tech that only someone with her bloodline can activate. It doesn’t help that a witch of the Cumaea is coming to Pontus hellbent on freeing one of the old gods to wreak havoc on earth. Haven is my favorite volume of the series so far: the baroque worldbuilding, which at times felt overwhelming in earlier volumes, seems more fluid and cohesive and plot-relevant in this volume. We get some very interesting hints about the titular monster, Zinn, and their connection to Maika’s bloodline, which I am excited to see play out in later books. The volume ends on a truly epic battle sequence whose aftermath delivers one of the crueler cliffhangers I’ve read recently – but in that good way that makes me yearn for the next volume, even as I’m still absorbing and thinking about this one. Finally, I’d be remiss if this review didn’t give a shout-out to Sana Takeda’s artwork. I’ve rarely read a graphic novel that was this richly illustrated. Takeda’s lush, meticulously detailed style meshes extraordinarily well with the fantasy setting. The two covers above are a taste of what’s inside, so if you like what you see, check it out! By clicking submit, you agree to share your email address with the Expansion Front and Mailchimp to receive book release alerts, author updates, and other emails from Caitlin Demaris McKenna. Use the unsubscribe link in those emails to opt out at any time. This entry was posted in Articles, Book Reviews, Women's Book March Challenge and tagged books, fantasy, women authors, worldbuilding. Bookmark the permalink.